As part of the construction of the Scarborough Beach Pool in Perth, Western Australia, AMC was involved with the supply and management of drilling fluids for the Scarborough Beach Pool Project’s geothermal drilling programme. Adam Jennings, Waterwell Manager for AMC in Perth discusses the achievements and challenges of the project. Tell us about the Scarborough Beach Pool Project. What were the objectives of the project? A detailed feasibility study undertaken by Rockwater indicated that it would be viable to install a Hot Sedimentary Aquifer (HSA) geothermal system for heating the aquatic centre swimming pools and it would save the local council, the City of Stirling, about $500,000/annum when compared with heating with natural gas. The system comprises a geothermal bore, constructed to a depth of 958 m into the Yarragadee aquifer and an injection bore constructed to 429 m depth; collectively a geothermal duplet. Warm groundwater will be pumped from the geothermal bore, through a primary heat exchanger and then back into a shallower part of the aquifer. The goal was to achieve warm water for the 50m outdoor pool and 25m learnt to swim pool, using deep direct geothermal as a heating source. Contracted to the project to assist with mud management, AMC provided on-site support and regular servicing on the site, to optimise fluid properties and improve Rate of Penetration. In your experience, was there anything that made this project unique? The project was unique due to its location and drill pad size; the drill pad was located in close proximity to residential apartments, and also occupied a section of the beach car park during the peak of summer. The drill pad had to be kept as small as was safe to operate and noise attenuation barriers were installed to minimise the impact to local residents. To minimise the disruption to the construction programme and the local residents, drilling activities were conducted around the clock to ensure timely completion of the project. Ongoing drilling kept the fluid circulating and the hole conditioned throughout the project. There was a lot of construction and movement around the site, the drill pad space was tight but the guys at Welldrill, AMC and Rockwater worked together well, to minimise their footprint and complete the job. Did you expect any issues with the lithology at the site? What measures were put in place to overcome challenges? There were several formations of concern when drilling the geothermal bores; Inert landfill comprised of unconsolidated sand and building rubble in the top 12 to 15 m and the reactive s South Perth Shale, which has a tendency to swell when drilled using water based muds. The landfill in the upper section made it almost impossible to maintain circulation to enable installation of the surface casing. After several attempts, an Auger rig was brought in to dry drill the top section and then the surface casing could be installed. AMC’s product training, monitoring and on-site support was able to treat the troublesome formation. AMC implemented a mud system consisting of a polymer base of AMC PAC R™ and AMC PAC L™ for viscosity, lifting and filtration control. Shale control was provided by Potassium Chloride (KCL) and AMC DET XTRA™, and lost circulation was improved by AMC BORESEAL™, to seal cavities in the porous formations. Was cost a factor in the supply of drilling fluids/equipment? What measures were taken to save project costs? The fluid system complimented on site by a AMC 2000 M™ and Welldrill’s mud cleaning system, which kept sand content and mud weight under control, and minimised the drilling footprint. The AMC 2000 M™ is a self-contained system, with a powerful high shear venturi mixing system allowing for fast addition and continuous workflow to improve efficiency. With both units, we were able to keep ahead of the curve and make daily additions to control the fluid before anything became an issue. The Scarborough beachfront is a popular area of Perth, used by locals and tourist alike. What measures were made to minimise disturbance to the local residents? Welldrill employed a silenced Fraste Rig and a noise attenuated generator. These both complied with 24 hour noise regulations at the nearest receptor; an apartment building located 60 m from the drill site. Welldrill further attenuated noise from the drilling operations using boarding and hay bales. Some of the drilling equipment exceeded noise regulations for 24 hour operations, this equipment was restricted to use during times where the regulations permitted higher noise levels. What problems did you encounter during the drilling program? What were AMC’s recommendations and why? AMC is involved with many geothermal projects around the Perth area, so we had a good idea what to expect and how to service these formations. Our objectives were to make sure the mud system was efficient, suitable for the formation and easy to mix. With the correct fluid properties, and maintained by the AMC 2000 M™ and Welldrill mud cleaning equipment, we were able to complete both the production bore and injection bore under budget and within project time schedule. Were there any special measures from AMC created for this project? AMC worked with Welldrill throughout the project from the early discussion and supply of a comprehensive mud program including costings and load outs. 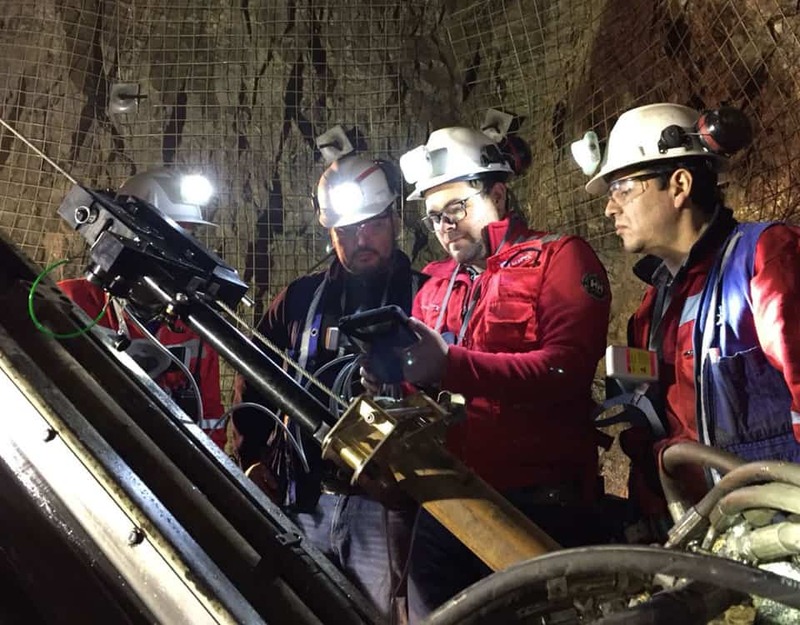 When drilling commenced, AMC provided daily on-site monitoring of the fluid, training and discussing recommendations to suit the geological formation. Several fluid samples were analysed in AMC’s drilling fluid laboratory, for Potassium levels , which were key in controlling the South Perth Shale formation. Mud cleaning equipment by AMC and Welldrill also kept the fluid in optimum condition. Lastly, what was the final outcome by the teams at AMC, Rockwater and Welldrill? The project was a success, completed on time and budget, the bores exceeded both the temperature and flow requirements of the geothermal heat exchangers and have the capacity to provide further heat energy if required for expansions in the future. This was a very high profile project as it coincided with the redevelopment of the Scarborough Beach foreshore. Local radio and print media reported on the project The entire drilling project had to go well and it did. Welldrill, Rockwater and AMC work extremely well together to complete this project on time and on budget without too much effect or interruption to the construction of the pool and amenities, and the residents of Scarborough. This article was published in the November edition of Australiasian Drilling Magazine.